For the second event of the ‘Writing for Liberty’ series, we welcomed Gillian Slovo, author of 12 novels, 2 verbatim plays, and the international bestselling memoir about her family, Every Secret Thing. 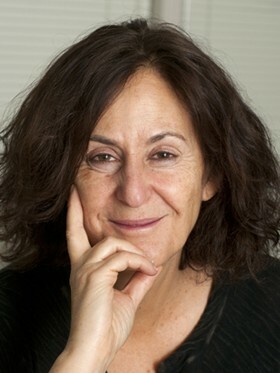 Inevitably, given that her parents were the famous ANC activists, Ruth First (murdered by the regime in 1982) and Joe Slovo, Gillian has always been associated with the anti-apartheid struggle, but her own writing is extremely varied, ranging from a series of detective novels to historical fictions, as well as the award-winning novel Red Dust based upon a particular incident in the Truth and Reconciliation Commission (TRC), which was made into a feature film. As well as being a novelist, playwright and journalist, Gillian Slovo is the current President of PEN International, the worldwide writers’ fellowship. She began the evening with readings from Every Secret Thing, her first piece of non-fiction writing, written after seven novels, one of which, Ties of Blood, focussed on two activist families in South Africa, one white, one black, probing the complex question of why people choose to become activists. She described the book as a praise poem to heroism and those who sacrificed their lives. Every Secret Thing, she said, is not a praise poem but a book in which she set out to explore why her parents did what they did. As well as being a close examination of heroism and integrity, including the costs and benefits of the choices her parents made, the memoir is, in some ways, also a portrait of, and testament to, a generation. As everything her parents did was ‘illegal’, a matter of life and death, family life was bound by secrets. Gillian first began to think about the book in 1990, the year when Joe Slovo returned to South Africa as part of Mandela’s negotiating team. She described how she had to overcome her self-prohibition about asking questions, and how her father did not want her to write the book, claiming ‘it’s not your life, it’s mine’; her own response was that it was both of their lives. Nevertheless, doubts remained and she spoke of the support and advice given by Barney Simon, the legendary director of the Market Theatre, Johannesburg. Determined to be as truthful as possible, she acknowledged how subjective truth is and that memory is shaped by what happens afterwards. Two very different readings from Every Secret Thing were taken from totally contrasting moments – 1963 when the ANC embarked upon its military struggle (with her father as Chief of Staff), and 1990 when she recorded the transformation of her father from communist and ‘enemy of the state’ to eventually becoming Housing Minister. The 1963 moment featured a very frightened and confused 11 year old child, stranded at an airport in the company of an escorting air hostess. What most of us listening probably would have never thought about was how much this child longed for a life of normality, with a bewildering desire to be like the air hostess. In response to a question from the audience, she mentioned that some of her father’s friends and comrades didn’t like the book because she was determined not to produce a hagiography, only a story of heroism but a more complex and critical narrative. Some accused her of having done what apartheid failed to do to her father (who died before the book was published). Despite their misgivings, she also spoke of things she had found out but didn’t include because they were too hurtful or damaging. The second reading was from Red Dust which was written as a complement to Every Secret Thing and focussed on the TRC. She mentioned how painful it was that the men who had murdered her mother applied for, and received amnesty and commented on the extreme difficulty of ever knowing the truth. How, she asked, can people who had caused such damage ever tell the truth. This is a question which underpins much of the novel as well. Deliberately, set in a part of South Africa she had never visited – the Eastern Cape – it was, she said, technically a difficult book to write because of its complex and multiple narratives constructed around the apartheid police, the family of a disappeared young man, the ANC MP who had been tortured, and the female lawyer returning from the USA to her home region. Given the demands of the book – one she didn’t really want to write – she produced a 10 page synopsis, not her usual practice, and then constantly re-wrote the opening chapters. Finally, she rejected the synopsis, threw out the chapters, and the experience changed the way she now writes. At the heart of the book is the deep tension between the torturer and the torturer, and the agonising situation of the latter who might have been complicit in his friend’s death but ultimately settles for the narrative he had chosen for himself. The novel is a profound exploration of guilt and accommodation, of how people manoeuvred themselves into acceptance of the regime. She wondered why so few of the security forces and police went to the TRC and confessed, speculating that to have done so would have destroyed their sense of self, fractured that fragile and enabling narrative of the complicit. The readings and commentary were rich, warm and very moving, and also a reminder that, although the apartheid regime formally ended almost twenty years ago, the crimes against humanity it perpetrated continue today in other forms, other places.